Hey, friends! It's been FOR-E-VER since I did a Nail of the Day post, but I painted my nails recently and really liked how they came out, so I thought I would share. 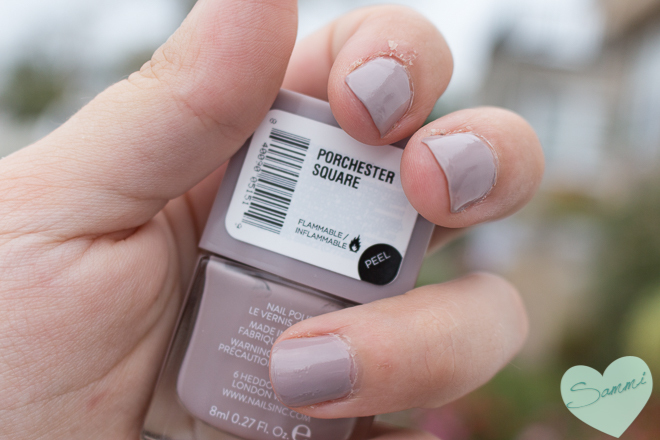 Today's nail polish is one by Nails Inc. in the color "Porchester Square." Porchester Square is a little garden square in London, England. Looking at pictures, I can kind of understand why they named it that. It's a great match for the neutral color of the buildings. The square shape of the bottle also lends itself to that. It's very classy looking. Take me to London, Nails Inc! This was my first time trying a Nails Inc. polish, and I have to say, I'm really happy I did. I got this color and another shade in my Lovely Day Limited Edition Birchbox. This one is a neutral, but still trendy since it's not a pale pink. I was unsure about the color at first, but it's really grown on me! Since it's still pretty light in color, if it chips a little, you can't really tell (it's not in-your-face like when a red chips, yikes). I started with SALLY HANSEN Miracle Cure ($9 for .5oz) as a base coat. 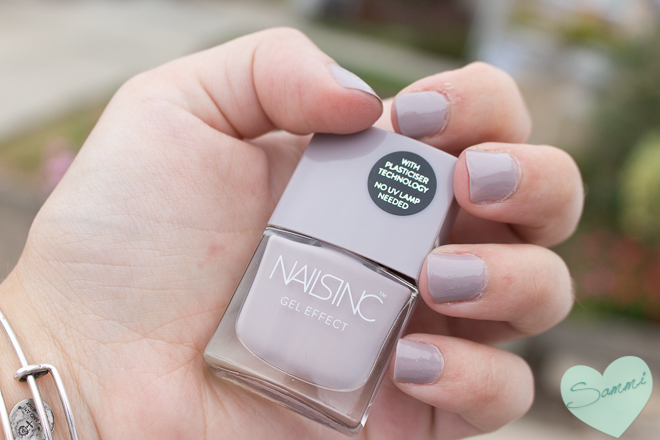 I like that it provides that base to protect your nails from the color, but also helps strengthen them. It's like treatment and style in one! After that, I applied two coats of the NAILS INC. Gel Effect in Porchester Square ($15 for .47oz). You could probably get opaque coverage with one thick coat, but I opted for two thin coats, which I think helped with the staying power later on. I finished up with a coat of DURI Rejuvacote ($7.57 for .61oz) on top. I got this from one of my very few trips to the nail salon. I like that it's not as thick and goopy as other top coats, but it still gives my manicure staying power and shine. I'm quite pleased with the staying power of this! 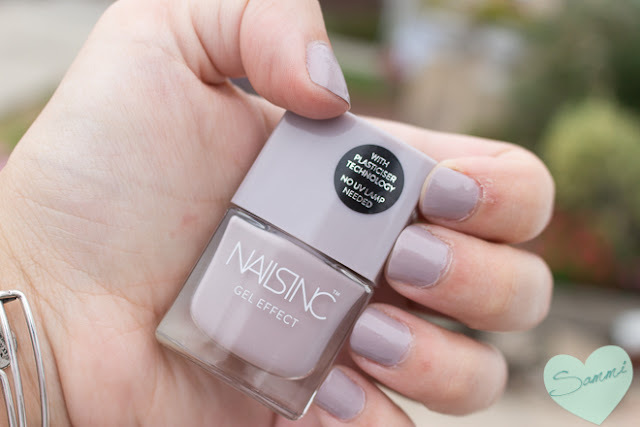 I am not nice to my nails--I'm always using them as tools, #noregrets--and this has been going strong. I wouldn't say it's as durable as a gel manicure, but in the few days I've had it on, I've had very minimal chipping, which is unusual for me. If I reapplied my top coat daily, I might have even gotten more wear out of it. Overall, I'm pleased with this polish on all counts. The color, the formula, the staying power. The only thing I'm not happy about is the price, but I'm willing to pay a few extra dollars to get my manicure to last longer. If it chips too quickly, it feels like a wasted effort, and then I don't paint my nails for two months (oops). What do you think? 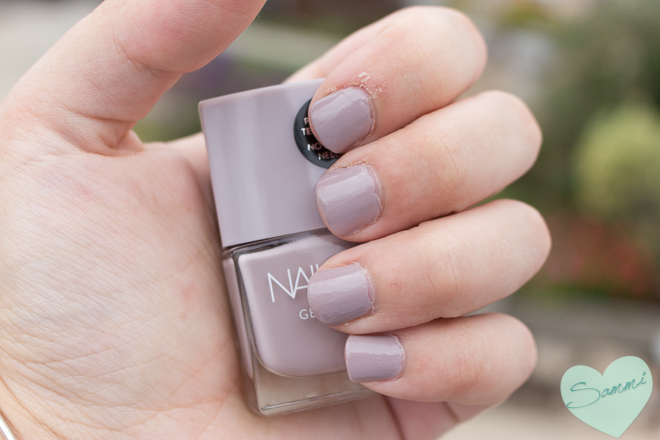 Would you wear this color? Want to see more of my nail polish posts? Disclaimer: All products were purchased by me. This post is not sponsored, but does contain a few affiliate links because I can.